Track Cleaning Dirty track is a problem that every model railroader faces. Most experienced model railroaders know that if you want clean track you have to use a bright boy track cleaner. A bright boy is basically an eraser which contains a gritty pumice like substance, similar to lava soap. Handling a bright boy with your bare hands destroys your hands pretty quickly. Wrapping it with a paper towel or rag helps a little but what you really need to do is to make a track cleaning tool. Here's the tip. Use a large pair of vise grips to hold the bright boy. This gives you a nice handle to hold onto. It extends your reach and reduces the amount of pressure that you have to use because the weight of the vise grips does most of the work for you. Quick Guide to Couplers Here is a quick look at Kadee H.O. scale couplers. Use #5 centered medium shank couplers for most cars. #148 is the same except for the springs are built in. 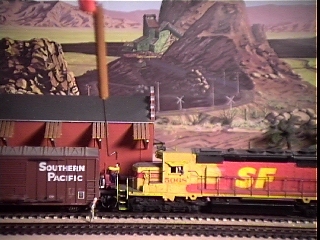 Use over shank if the coupler is too high as compared to the height gauge. Use under shank if the coupler is too low. 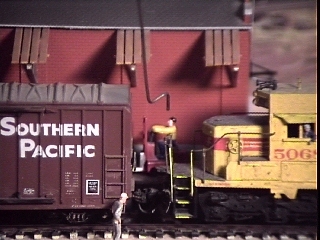 This is common for Athearn Blue Box kit locomotives. GPs are high while SDs are low. Use long shanks for locomotives with snowplows. To replace truck mounted couplers use Kadee #148 with Kadee #212 Talgo Truck Adapters. You might have to trim the whisker springs a little bit to make them work better. Or else you can cut off the coupler pocket with a razor knife and glue a 0.040" piece of styrene to the body and glue a #5 coupler box onto it. To replace Rivarossi (AHM) style truck mounted couplers use Athearn McHenry (McH ) #56 for freight cars or McH #52 for passenger cars. To uncouple Kadee compatible couplers I use a home made uncoupling tool which is based on a design by Lionel Strang. I use the end of the tool to grab the 'brake hose' and separate the couplers. I make sure I have slack in the couplers before doing it so that the couplers have room to detach from each other. This tool works pretty well. I would never use a barbecue skewer to uncouple cars because it can damage the coupler and or the coupler pocket and knock the couplers out of alignment and cause them to be at an improper height.